Welcome to Shred Wise, Inc., a trusted South Orange County provider of mobile document destruction services for Mission Viejo and Aliso Viejo. Our family owned and operated business has been providing both one-time and regularly scheduled shredding services to thousands of commercial and residential customers since 2006. We are known for offering secure and convenient paper shredding at highly cost-effective prices. Additionally, because we are committed to customer satisfaction, we always offer professional, responsive, and flexible service. We know our clients by name and are available seven days a week to assist them with their document destruction needs. Our staff includes information destruction experts with years of mobile paper shredding experience and extensive knowledge of today’s local, state, and federal privacy laws. They excel in designing personalized shredding solutions for individuals as well as businesses of every size and type. In fact, our commercial clients throughout Mission Viejo and Aliso Viejo have been so diverse that we have learned to truly understand each industry’s unique challenges and needs as they pertain to information destruction and how our South Orange County document destruction services can help them. As a full-service paper shredding company serving South Orange County, we can shred your sensitive documents at your Mission Viejo or Aliso Viejo business or home; pick up your documents in a panel truck and shred them at our facility in Orange; or accept your small quantity of boxes of paper at our site. In all cases, our shredding services comply with all privacy laws (including GLB, HIPAA, and FACTA), and are performed using top-of-the-line shred trucks with the capacity to shred more than 6,000 pounds of paper an hour. Once the shredding process is complete, we issue a Certificate of Destruction and take 100% of our shredded paper to a recycling facility. Call today for a free quote. We can answer your questions about how to keep your information and data secure, as well as provide on-site consultations. We are licensed, bonded, and insured; and we are National Association for Information Destruction (NAID) compliant. We’re readily available to help you with all of your document destruction needs in Mission Viejo, Aliso Viejo, or other South Orange County city. We welcome drop-offs 7am to 5:30pm Monday through Saturday, and 8am to 12pm on Sundays. Our drop-off is located at 3222 E. Chapman Avenue., Orange, CA 92869. Mobile shredding services are provided Monday through Friday anywhere in South Orange County. Since we are a locally based shredding company, we can often accommodate last-minute requests for same-day or next-day service. 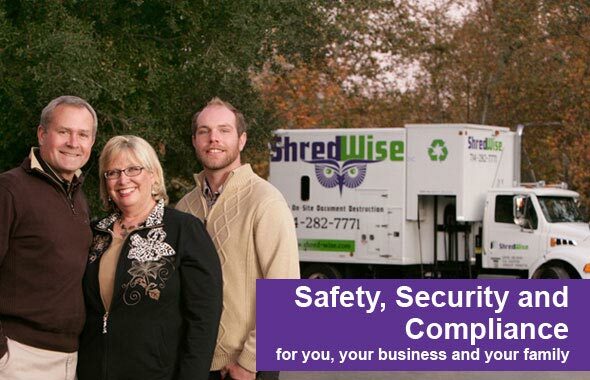 For nearly a decade, Shred Wise has been trusted by businesses in Mission Viejo, Aliso Viejo and across South Orange County to safely and securely destroy their sensitive documents. Our mobile shredding services provided in South Orange County comply with FACTA, GLB, HIPAA, and other privacy laws, so we can be trusted to properly dispose of medical records, tax records, bank reports, credit card information, client lists, consumer data, proprietary information, and more. Our mobile shredding services are not only compliant with today’s strict privacy laws and regulations, but they are also more efficient, secure, and cost effective than trying to do it yourself. When a business does its shredding in house, it needs to have one or more high-capacity shredder as well as secure containers for storing all sensitive documents until they can be shredded. Unfortunately, as many of our clients in Mission Viejo, Aliso Viejo, and other South Orange County cities have found, these shredders break down a lot, need to be manually fed, and can easily require substantial employee time. 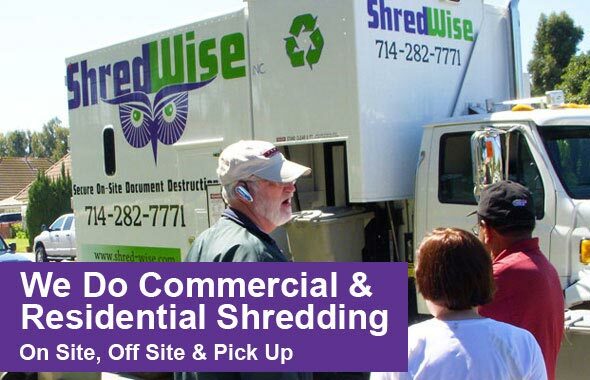 To help our commercial clients in South Orange County, Shred Wise’s has designed its mobile shredding services to save them as much time, money, and hassle as possible. With every mobile shredding service, we’ll arrive within the promised timeframe; pick up and shred your sensitive documents according to the industry’s best practices; invite you to witness the shredding yourself; and provide you with a Certificate of Destruction when we are done. We’ll then dilute your shredded papers with hundreds of pounds of other shredded paper, and take it to a nearby facility to be recycled into new paper products. There is no need to spend time removing staples, rubber bands, or paper clips; and having a third-party verify that you destroyed your documents as part of a records retention schedule gives your company greater protection against possible lawsuits or fines. Plus, we recycle 100% of the paper shred. Call today to learn more. When we’ve done outreach at community events, conferences, or businesses, many of those attendees will tell us that they didn’t realize how vulnerable they were to identify theft and how easy and affordable it would be to arrange on-site shredding at their home and have shredding services performed curbside. This is usually the case when our residential clients in Mission Viejo and Aliso Viejo can also join together with neighbors who they can split the cost with. So, call today and obtain a free quote for on-site/mobile shredding services in South Orange County. Off-site shredding is another way our clients in Aliso Viejo and Mission Viejo can benefit from Shred Wise’s efficient and cost-effective shredding services. This option is ideal when your site is inaccessible to a mobile shred truck sometimes there isn’t enough overhead clearance for our truck to reach certain locations), or if you prefer to have your documents picked up and shredded away from your building (either because you have a very large volume of paper to destroy and don’t want to have it all shredded curbside, or you already have a fairly busy street or parking lot and don’t want our truck contributing to the traffic congestion). With Shred Wise, off-site shredding involves having one of our professionals drive a secure panel truck to your site in South Orange County; pick up your bags, boxes, or bins of paper and load them into our truck; and transport it all back to our facility in Orange. Once on site, we proceed with shredding your sensitive documents in one of our mobile shred trucks and issue you a Certificate of Destruction once we are done. Call today to obtain a personalized quote for our South Orange County off-site shredding service. 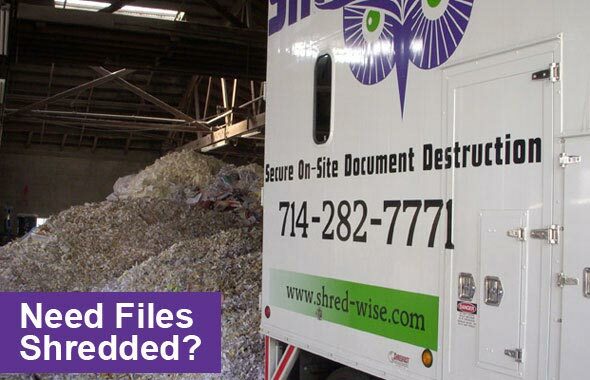 Shred Wise Inc. consists of information destruction experts who are happy to help you create a document shredding plan for your needs and budget in Mission Viejo or Aliso Viejo. We’ll help you determine whether you would benefit most from on-site or off-site shredding, or one-time or ongoing shredding. We can also help South Orange County businesses who need to ensure that their practices are compliant with today’s local, state, and federal privacy laws, as well as those who need to create a records retention schedule. Additionally, we keep our services flexible, so we can adapt them as your shredding needs change over time. If you would like to learn more about our South Orange County shredding services, call now: (714) 282-7771. In general, Shred Wise Inc. recommends that our South Orange County clients securely store and shred anything with two identifiable or personal pieces of information on it, such as documents with a name and address, name and phone number, account and password, email and ID number, etc. Such information can often be found on bank account statements, bids, business reports, cancelled checks, client lists, contracts, correspondence, credit applications, credit card statements, insurance policy information, invoices, job applications, legal documents, medical records, memos, payroll records, personalized junk mail, quotes, receipts with signatures, student records, and tax records. Additionally, the list of documents you should shred expands even further when you consider that anything with a debit card number, credit card number, social security number, driver’s license number, or bank account number should always be kept secure. At Shred Wise, we are invested in building long-term relationships with our commercial and residential clients in Aliso Viejo, Mission Viejo, and South Orange County. In order to do this, we prioritize customer service, dependability, and trust. As a result, our clients can always expect service with a smile, a willingness to accommodate unique or last-minute shredding needs, and safe and secure document destruction. Our document destruction services include on-site shredding (performed by our mobile shred truck) and off-site shredding (performed at our facility in Orange) that can be requested as needed or set up for regularly scheduled, ongoing service.